Spring might be behind the door, but we still have a few weeks (months?) to go through before we get to spend our evenings and weekend outside. 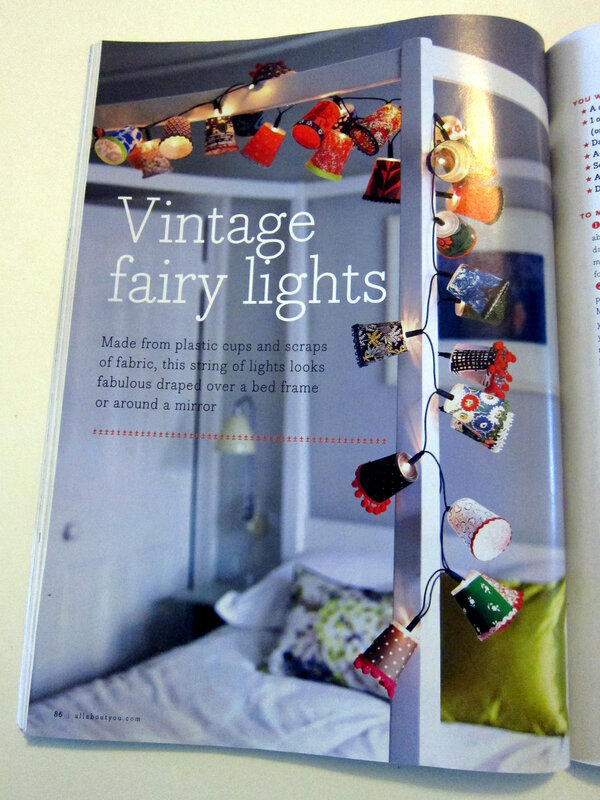 The following project will take you between one or two evenings and the final result will look fabulous in your bedroom or wherever you will decide to hang you vintage fairy lights to.I read about this project in a Prima magazine, and they themselves found it in the book Make Your Own Lampshades by Elizabeth Cake which I just ordered (yeah, more lampshade projects coming!). Trip your plastic cups to size required (I trimmed mine to get them 6cm long) and then cut a small cross in the base of each cups using some sharp scissors. Make a template by rolling one cup along a sheet of paper and by following the top and the bottom of the cup with a pencil. Tip: make a mark on the base of the first cup so you know when you have rolled once round. Add 1 cm at the end and cut the shape. Test it in your cup, and if you are happy with the shape, draw around it on the thin card and cut it out. 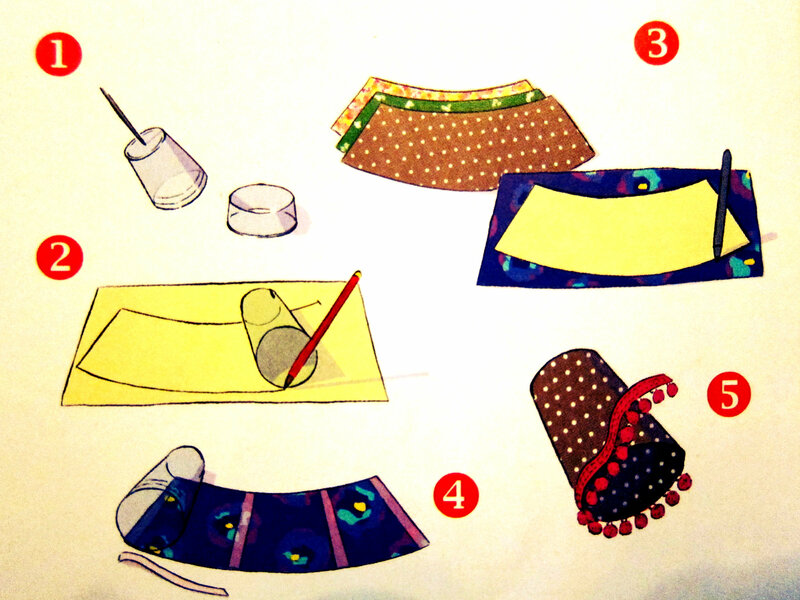 Using the cardboard template, cut 20 shapes in your fabric. Tip: pin your template in 2 layers of fabric to go faster. Don’t do it with more than 2 layers as it won’t give you a neat result. Put glue on the edge of your pieces of fabric, then roll the fabric on your plastic cup and press down on the edges to stick. Repeat for the 20 cups. Measure round the open end of a cup and cut a piece of trimming 1 cm longer than this. Repeat 20 times. Attach to the very edge of each mini shade using glue. 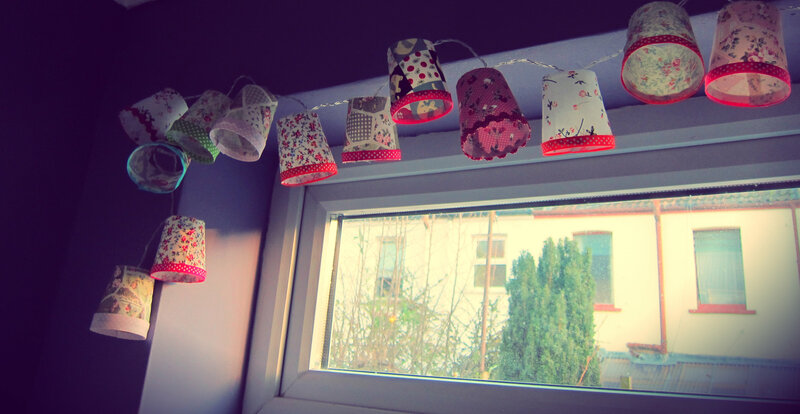 Push a fairy-light bulb through the base of each cup. You did them! They look so good! I’m definitely making these soon! Did I not show you the picture when I made these in December? Yes you should make some! 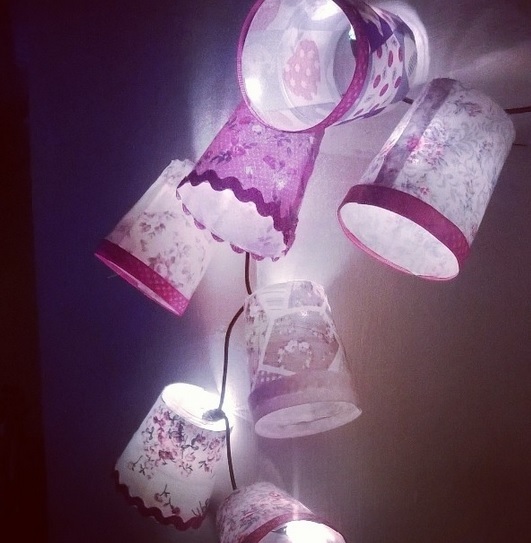 The next project for me will be origami fairy lights to use in the yard.